The Launch Readiness Review (LRR) took place on Monday, August 20, 2018 in Kourou, French Guiana for Arianespace Flight VV12, and both the Vega launcher and the Aeolus satellite were declared ready for launch. However, because of unfavorable weather conditions over the Guiana Space Center at Kourou, the final countdown operations for Flight VV12 – originally planned for Tuesday, August 21, 2018 – have been postponed. Both the Vega launcher and the Aeolus satellite are in stabilized configuration and under fully secure conditions. 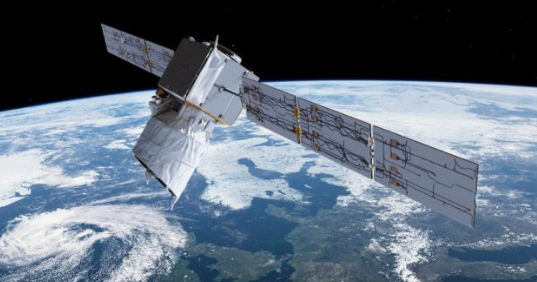 The European Space Agency’s Aeolus wind-monitoring spacecraft will be orbited during the mission designated Flight VV12 in Arianespace’s launcher family numbering system, providing much-needed data to improve the quality of weather forecasts and contribute to long-term climate research. It was built by Airbus Defence and Space and carries a laser Doppler wind LIDAR (Light Detection and Ranging) system called Aladin to probe the lowermost 30 km. of the atmosphere in measuring winds around the Earth. During a busy period of activity across the Spaceport, Aeolus has been hoisted to the upper level of the Vega Launch Complex’ protective mobile gantry and integrated atop its light-lift launcher. Separately, Azerspace-2/Intelsat-38 was transferred to the S3B payload preparation facility, positioning the satellite for fueling. The LIDAR’s near-real-time observations will provide reliable wind-profile data to further improve the accuracy of numerical weather and climate prediction, and advance the understanding of tropical dynamics and processes relevant to climate variability. Aeolus is the eighth Earth observation mission performed by Arianespace for the European Space Agency, which address key scientific challenges identified by the science community and demonstrate breakthrough technology in observing techniques. The spacecraft will be placed in a Sun-synchronous orbit. Flight VV12 is targeted for an evening launch on August 21 and will be the 12th flight with Vega since its introduction at the Spaceport in February 2012. The light-lift launcher is provided to Arianespace by prime contractor Avio of Italy. Arianespace’s Flight VA243 on September 7 will be a milestone in the career of Ariane 5, marking the 100th liftoff of the workhorse heavy-lift vehicle. 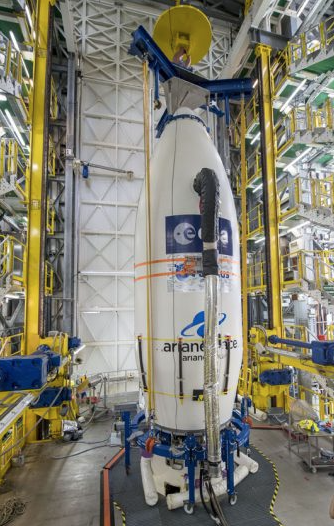 For this evening launch, the Ariane 5 ECA version – equipped with the ESC-A cryogenic upper stage – will be used on another of Arianespace’s dual-payload missions to geostationary transfer orbit. The Ariane 5 is provided by ArianeGroup as production prime contractor. Horizons 3e, to be installed as Ariane 5’s upper passenger on Flight VA243, is owned by a joint venture of Intelsat and SKY Perfect JSAT Corporation. In completing Intelsat’s EpicNG global coverage, it will provide coverage for aeronautical and maritime mobility, fixed and wireless operators, as well as mobility and government customers. Built by Boeing, this is the first Intelsat EpicNG satellite to feature entire Ku-band spot beams utilizing multiport amplifiers that optimize power across the satellite. The Azerspace-2/Intelsat-38 payload to be orbited by Flight VA243 from Ariane 5’s lower passenger position is designed to provide a range of telecommunications relay duties at the service of its two operators. For Azercosmos – a company owned by the government of Azerbaijan Republic – the satellite will support growing demand for Direct-to-Home (DTH), government, and network services in Europe, Central and South Asia, the Middle East and Sub-Saharan Africa. For the Luxembourg-headquartered Intelsat, the spacecraft is to deliver continuity of service from the 45 deg. East longitude orbital location, which provides DTH platforms for Central and Eastern Europe as well as the Asia-Pacific region, while also offering connectivity for corporate networks and government applications in Africa.